The PlexBright LD-1 Single Channel LED Driver (LD-1 LED Driver) is a powerful, compact, light-weight and economical alternative used to provide independent control output of up to 1200mA to one or two PlexBright LED Modules - a great choice for those wanting to deliver constant light output, or are able to generate their own TTL/analog control signals. The LD-1 LED Driver can control one LED Module or two LED Modules simultaneously with each module receiving the same control signal. This dual-mode configuration is particularly applicable to bilateral stimulation experiments. PlexBright Starter Kits offer the initial products to get started and a discount when purchased as a kit. Kits are available in four experimental designs and with either driver the LD-1 Single Channel LED Driver (economical kit), or our more sophisticated device, the PlexBright 4 Channel Optogenetic Controller with Radiant™ Software (fully functional kit). Precision dial and display: Can be used to modulate a constant output current to control PlexBright LED Module output at a set intensity. This output may also be manually pulsed. 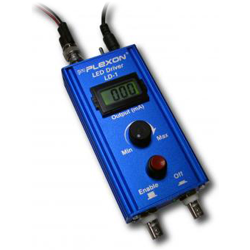 TTL input: Accepts a TTL input for generating precisely timed pulse patterns at the intensity set with the dial-and-display with sub-millisecond response times. Analog input: Accepts an analog input that can be used to deliver arbitrary output patterns such as ramps or spikes.